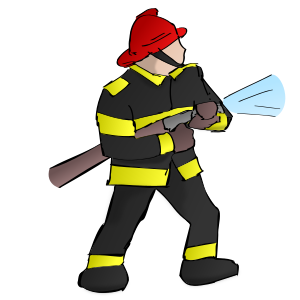 Managers and firefighters are the two kinds of protectors in IFS. In IFS, two parts are polarized when they are in conflict with each other about how you will behave or feel in a certain situation. This article is an excerpt from my new book, Self-Therapy, Vol. 2. I also teach about polarization in my Advanced IFS Classes. Managers and firefighters are the two kinds of protectors in IFS. They are frequently polarized with each other. Most firefighters tend to be oriented toward excitement and intensity, fun and thrills. Most managers tend to be oriented toward control and order, especially if they are trying to stop the destructive activity of firefighters. In fact, as a result of successful IFS work, you might experience a decrease in the thrills that come from firefighters and begin to feel that your life has become boring. This difference in orientation between managers and firefighters lends itself toward polarization. Because firefighter activity is often dangerous and self-destructive, managers come forward that are judgmental of firefighters and try to limit their behavior. In fact, for every harmful firefighter, there is usually a manager that is polarized with it which is trying to stop the firefighter from causing problems in your life. When a manager doesn’t succeed in stopping a firefighter, it often becomes harshly judgmental toward you for engaging in the firefighter activity. It shames you in an attempt to prevent the firefighter from acting out again. For example, after you binge on food, a manager may arise that shames you for getting out of control. When your life is being ruined by a firefighter, it is easy to think that you just need to work with this part and get it to change. However, because of the presence of polarization, it usually isn’t enough to only work with the destructive firefighter and the exile it protects. You often must also engage with the controlling manager and work on the polarization directly. This excerpt, When to Switch Target Parts, is from my upcoming book, Self-Therapy, Vol. 2, which is an advanced book on IFS. Let’s suppose you have chosen a protector to work on, called your target part. As you are getting to know it, another part may emerge. It is best to take a moment to feel the new part’s emotions or body sensations and perhaps ask it a question or two. Then make a conscious choice about whether to ask it to step aside so you can continue with your original target part or whether to switch and make the new part your target part. A concerned part or protector won’t step aside. An important new part arises. A part arises that is usually not accessible. A part insists on being heard. The target part is afraid of another part. The target part takes orders from another part. You want to finish with the target part. You haven’t finished with any parts. The target part feels ignored by you. How do you tend to deal with the question of switching target parts? There are healthy and problematic ways of doing this. One problematic way is the Scattered Pattern, which involves following each new part that arises without making a conscious choice to do so. Whenever a new part pops up, even if you are in the middle of working with a different part, you turn your attention to the new part without even considering whether or not this is a good idea. If you do this very often, your work will end up being scattered. You will get pulled this way and that. Every new part will take you off in a new direction, and you won’t make much progress with any one part. You will bounce around in your psyche, not getting far enough along with the steps of the IFS process for real therapeutic change to happen. The opposite extreme is the Rigid Pattern, which involves being so focused on staying with your target part that you ignore other parts that arise. You are like a horse with blinders on. Or, if you notice another part, you immediately ask it to step aside without acknowledging it or considering its importance. You might overlook a part that is crucial to work on that day. For various reasons, a part that spontaneously arises might be important to deal with, and you won’t realize this because of your single-mindedness. A part may spontaneously arise that has an important relationship to your target part. It might be polarized with the target part. It might be an exile being protected by the target part. It might be allied with the target part. You don’t want to ignore a part like this; you want to get to know it because this will help your work with the original target part. The parts that are arising and being ignored might become resentful and sabotage your work with the original target part. From May 5 – 9 you can get a free Kindle version of The Professionals’ Guide to Self-Therapy Journey on Amazon. 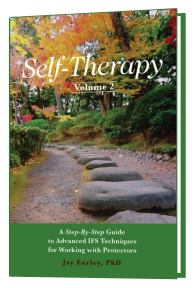 Self-Therapy Journey (STJ) is the first general-purpose online tool for psychological healing and personal growth. It is not intended to be a substitute for psychotherapy or counseling. You can think of it as a sophisticated and interactive set of self-help books, plus guided meditations and customized reports. Though it is designed for users to explore on their own, STJ is especially useful as an adjunct to psychotherapy or coaching. What can STJ help your clients do? Identify and develop healthy capacities. Clients get insight into their dysfunctional patterns and the underlying psychodynamics. STJ provides recorded guided meditations for deep exploration. Clients get a customized report for each of their patterns. Clients are guided in creating personalized homework practices. The Professionals’ Guide to Self-Therapy Journey will help you understand what your clients can get from STJ, how it works, and how you can support them in that process. 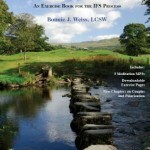 Remember the dates: May 5 – 9 get your free Kindle version of The Professionals’ Guide to Self-Therapy Journey on Amazon. Why is my partner acting that way? What is going on to keep me stuck in life? What am I doing to turn people off? Why am I attracted to the wrong people? How can I understand my personality? The Pattern System is a breakthrough in understanding your personality that is oriented toward psychological healing and personal growth. It also helps you to understand other people—why they respond as they do, what makes them tick. Once your have understood the Pattern System and explored yourself according to its model, you will come away with a comprehensive map of your psyche. You will be able to see your strengths and your defenses, your places of pain and how you compensate for them. You will understand the structure of your inner conflicts and see the leading edge of your growth. How can I understand my clients’ personalities in a fuller way? Why is that client’s therapy not moving? What is going on in my relationship with that client? What is the primary issue for that client? What are the psychodynamics underlying that behavior? The Pattern System: A Periodic Table for Psychology can help you answer these questions. You can fully understand your clients’ personality patterns—not just their “type” but the detailed structure of their psychology. I am very excited to publish a workbook that goes with the Self-Therapy book (by Jay Earley). This book has been so popular that creating a workbook to go with it has been long over-due. 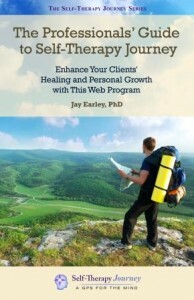 This workbook is a companion to Self-Therapy by Jay Earley. 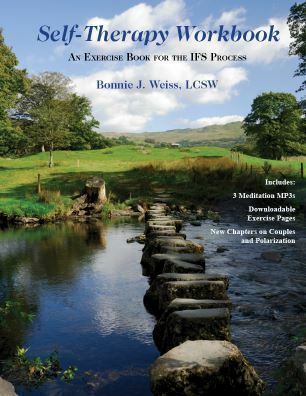 It is a clear and concise description of the steps in the IFS process designed for people using IFS to do personal work on themselves or professionals introducing the material to their clients. It provides written exercises that give readers a chance to process their experience and track their internal work. It includes sample answers that clarify how to do the exercises, and illustrations that provide a visual understanding the material. There are additional chapters on working with couples and dealing with polarization. The following is an excerpt from Freedom from Your Inner Critic. In doing IFS work with Inner Critic parts, you discover that they are actually trying to do something positive for you, even as they cause pain and hardship. However, there is another aspect to many Inner Critics. They are often modeled after a parent or other significant person from childhood. Therefore, sometimes it isn’t enough to discover a Critic’s positive intent and heal the exile it is protecting. In order to help your Critic to fully let go of its attacks, you may also have to deal with how the Critic learned to attack. In IFS, this is called a legacy burden. The protective role that a Critic has adopted is called its burden in IFS. When a Critic is playing a role (carrying a burden) that it modeled after a parent, this is called a legacy burden. If your father pushed you to work very hard and criticized you when you didn’t, you may develop an Inner Critic that does the same thing. It has taken on this legacy from your father. If your mother always compared you negatively to your sister or friends, you may develop a Critic that does the same thing. Often a Critic models its style of criticism on a parent even though it may criticize you about different issues. For example, Joan’s mother criticized her for being sloppy and judged her for not keeping herself as neat, clean, and organized as her mother wanted. She did this by calling Joan names-e.g. “slob,” “lazy girl.” Joan has long since disavowed her mother’s extreme focus on neatness, so her Inner Critic doesn’t judge her about that. But Joan does have a Critic that judges her for not being attractive enough to men. And guess what, that Critic attacks Joan by calling her names, except that now the names are related to the attractiveness issue-“loser,” “ugly girl,” and so on. Same style, different content. A legacy burden might not only come from a parent, but from an entire ancestral line. Maybe your father pushed and judged you about working hard, and maybe his father did the same to him, and perhaps his father’s father and the entire line of male ancestors were burdened by this extreme need to overwork. Of course, each of these men probably had different life circumstances and motivations for their overworking. An ancestral burden like this can have a profound effect on you without your being aware of it. Click here to learn more about Freedom from Your Inner Critic or purchase it. The Pattern System book is now available in both Kindle and PDF versions as well as the paperback. 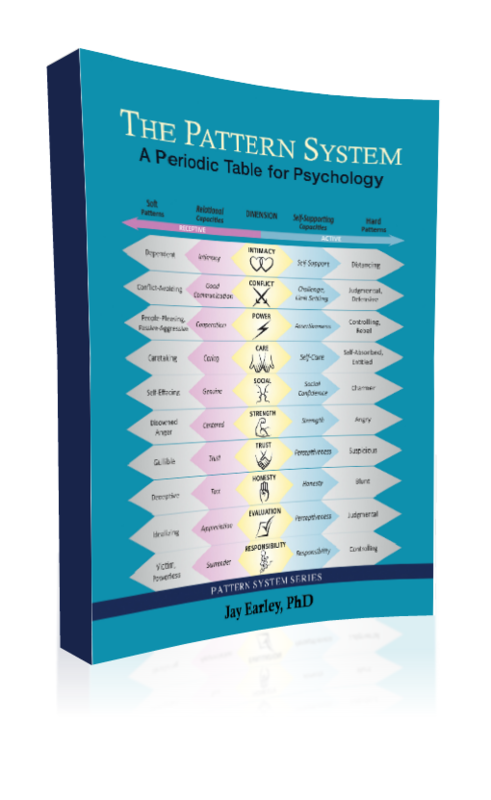 The Pattern System is a systematic approach to understanding your personality that can lead directly to psychological healing and personal growth. It also helps you to understand other people–why they respond as they do, what makes them tick. Once your have understood the Pattern System and explored yourself according to its model, you will come away with a comprehensive map of your psyche. You will be able to see your strengths and your defenses, your places of pain and how you compensate for them. You will understand the structure of your inner conflicts and see the leading edge of your growth. The Pattern System will make clear what you need to explore next to resolve the issues that are most important to you. You will know where there is underlying pain, shame, or fear that must be healed. You will know which psychological capacities you can develop (or are already developing) to make your life happier and more productive. You will see how to ground your spiritual development in higher functioning in your life. Therapists, coaches, and other helping professionals can use the Pattern System to understand the details of the psychological structure and dynamics of their clients. Researchers can use it as the basis for psychological studies. The Pattern System is based on 40 years of observing my clients’ behavior, emotions, underlying psychological issues, and their origins in childhood. This has been enhanced by many years of providing supervision, training, and consultation for therapists and many discussions with colleagues. I have put this together using my background in systems thinking and computer science. It is a new way of organizing into useful form the extraordinary amount of data that psychotherapists absorb about our clients. For more information you can also visit the Pattern System website. This is an excerpt from Your Interpersonal Patterns. Julie felt stuck in her work life. She wasn’t really happy with her job and didn’t feel that she was doing well in the eyes of her boss. She also had trouble finding a love relationship that would work out in the long term. She had an easy time getting involved with men, but none of the relationships worked out. Either she would get fed up with the man or he would leave her. She knew that her problems probably came from some unresolved psychological issues, but she didn’t know what those might be. When she studied the Pattern System, it helped her to understand her psychological patterns that were getting in the way of getting what she wanted in life. She was also able to understand her boyfriend’s patterns and those of the men she typically got involved with. In exploring her work life, she realized that she had a Passive-Aggressive Pattern. She wanted to please people but unconsciously resented the power they had over her and acted out this resentment in indirect ways. This happened repeatedly with her boss. She would take on any project he asked her to do without really considering whether she wanted to do it or whether she had the time for it. She did this because she wanted to please him, which is one half of the Passive-Aggressive Pattern. Then she would feel resentful and defiant towards her boss for piling so much work on her. However, she didn’t feel that she had the right to feel this way, so her resentment was buried in her unconscious, and she acted it out indirectly. This is the other half of the Passive-Aggressive Pattern. Julie would put off working on these projects for her boss and end up missing deadlines. Sometimes she would do a project in her own way which wasn’t quite what her boss wanted. He would get angry about this and her lateness and demand that she do exactly what he wanted and finish on time. She would apologize and promise to do better, but underneath she became even more resentful and rebellious toward him. This came out in further Passive-Aggressive behavior. She never dealt with this problem directly with her boss. This was partly because she didn’t understand what has happening and partly because she had a Conflict-Avoiding Pattern. This meant that she avoided bringing up issues that needed to be dealt with because she was afraid of conflict. So she never tried to talk about the difficulties with her boss so they could change these dynamics. Even when her boss tried to talk with her about their difficulties, she would just become frightened and say she would do better. However, this was coming from her Conflict-Avoiding Pattern and not from a real understanding of what was going wrong or what to do about it. Thus there was no way to improve things with her boss. In examining her love life, Julie realized that she had a Self-Effacing Pattern, which means that she didn’t feel confident in social situations, especially with men she was attracted to. She tended to be attracted to men who had a Controlling Pattern and sometimes also a Dependent Pattern. This was certainly true of her current boyfriend Alan. Because of her Passive-Aggressive need to please people and her insecurities that came from her Self-Effacing Pattern, she was drawn to Alan, who seemed to be strong and know what he wanted and how to operate in life. Julie also had a Caretaking Pattern, which meant that it was important for her to take care of people, especially men she was involved with. She got a lot of self-esteem from being needed and unconsciously expected to get love in return. From studying the Pattern System, she could see that Alan had a Dependent Pattern and therefore really needed her caretaking. This was another reason they were attracted to each other. However, because of Alan’s Controlling Pattern, he was constantly telling her what to do and expecting her to give in to what he wanted. Julie fairly quickly came to resent this, and she consequently responded in a Passive-Aggressive manner that frustrated him. While at first she was very caring and loving, after a while she began to pull back from him and not be the all-giving mother that she had been. She would still claim that she cared for him, but she was actually withdrawn and distant much of the time. This was a way of protecting her autonomy and also indirectly expressing her resentment. This was very upsetting to Alan because of his Dependent Pattern. He became sad and hurt when she didn’t take care of him, and he would often respond by becoming more Controlling in an attempt to coerce her into meeting his needs. However, this just triggered her Passive-Aggressive Pattern even more strongly and she further withdrew from him. This, of course, triggered his Dependent Pattern even more intensely and around and around they went. In reflecting on her past relationships, Julie saw that she had repeatedly been attracted to men with this combination of Controlling and Dependence and that her relationships had usually unraveled in a similar way. This book covers these dimensions, and their patterns and capacities, in enough detail that you can use it to work on any issues you have in these areas. Right now I have a rough draft of this book, and I am looking for people who would be willing to read it and give me detailed feedback on it in the next month. I don’t need editing per se. What I need is feedback on the content, the organization of the book, and anything else that grabs you. If you are willing to put in the time to do this, email me at earley.jay@gmail.com. Let me know something about who you are and your background that would make you a good reviewer. Thanks. Here’s an excerpt from Your Interpersonal Patterns. I am pleased to announce the publication of my first book on the Pattern System. It is now available in paperback and a Kindle version will also be available soon. The Pattern System is an essential coaching asset, especially when I’m puzzled about the best tack to take or a client isn’t progressing. For one client, it led a breakthrough. For another, it helped us to gracefully disengage. Jay Earley’s system complements and extends the IFS framework by adding more awareness about different kinds of parts and how they organize. How “patterns” can evolve to “capacities” helps me and my clients generate more hope and Self-energy. And the sections on pattern-related transference/countertransference made me much more aware of my own parts that were challenged by certain client patterns. And, better still, helped them step back so I could work more effectively. I also appreciate Jay’s courage in using himself as a case for illustration, and creating a wiki so a broad community can continue to extend the work he’s initiated. Over the past 40 years I have worked with people in the fields of education, psychotherapy, and spiritual counseling. Training and diagnostic manuals in these fields focus on issues from the severe disorders to the neurosis. This point of view does not do justice to the majority of my clients and students because it looks at the world of psychological health from a place of disease. I began looking at recurring patterns, configurations and situations that did greater justice to the human and spiritual potential of my clients. Upon reading The Pattern System I saw much of my own thinking on paper, only in a more thorough and sophisticated way. This was a treatise that I dreamed of writing! It moves the subject of human development from a “Newtonian” to an Einsteinian point of view. Jay Earley’s understanding of human growth and development as following certain patterns is a very necessary counterpoint to the conventional notion based on sickness. At last someone is steering the conversation in a much more comprehensive, holistic and complementary direction. I am so glad that The Pattern System can find a wider audience as a book and stir the debate about how to look at psychological health and human growth. This is excellent stuff! I found The Pattern System clear and easy to understand and work with. Earley is pulling together a huge framework here, and the content is spot on. I’m a psychologist myself and meet individual clients on a daily basis, and it was easy for me to recognize most of the patterns in my clients as well as myself. I found the countertransference chapter to be the most interesting personally! 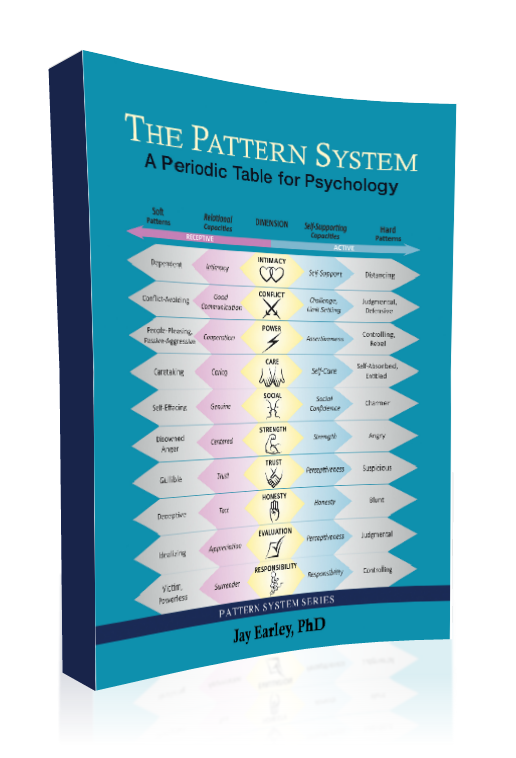 In my opinion the Pattern System is a rich body of work, a unique contribution to the field of psychology, and a much needed systems-oriented framework for the discipline. I find Earley’s writing persuasive, uncomplicated, and directly useful; most of the diagrams are informative, albeit plain. Overall, I enjoyed The Pattern System, learned much from the writing and would recommend it to anyone interested in personal development. Humanity has accumulated a vast array of valuable insights, derived from numerous schools of thought, regarding the complex dynamics involved in human psychology and behavior. There is a vital need for an integrative model that can, by organizing it, serve as a framework for understanding and a guide for useful application. With the innovative Pattern System, Jay Earley has made great strides toward this goal. It provides an extensive map by which to systematically navigate as we identify areas of functioning in all arenas and at all levels of health or dysfunction, discover their underlying origins and psychological configurations, and strategically pursue development. It will prove helpful not only to therapists and coaches and their clients, but to people in all walks of life and in any situation. Moreover, it has implications for families, communities and society on a larger scale and is a prototype that can inspire and catalyze further innovation in the years to come. To learn more about the Pattern System please visit The Pattern System website.